Daniel Goodard, star of “The Young and the Restless” (Y&R) took to the photo sharing site to post a GIF that is bound to make you grin. And in these turbulent times, we could all use some joy wherever we can get it. Soap Cities co-founder/co-Editor-in-Chief Akbi Khan admits she’s not a big fan of GIFs, those nano-movies on a continuous loop. They give her anxiety and a headache! But when even she saw what Goddard (Cane Ashby) posted to Instagram, she laughed out loud (LOL-ed, in keeping with the online abbreviations). Scroll down to see his full post. Goddard posted a GIF of himself, on-screen wife Christel Khalil (Lily Winters), and co-star Melissa Ordway (Abby Newman). He encouraged his followers not to let “all the craziness” get them down. He and his costars are movin’ and groovin’! As Trump issued an executive order banning immigration from certain Muslim-majority countries, the country erupted into rightfully angry protests in response. Fear, suspicion, paranoia, hopelessness–you’ll forget them all for a moment when you see this IG post. Too bad Lily and Cane can’t see this GIF. Soap Cities recently wrote of the drama that is ahead for this Genoa City supercouple. And for her part, Abby may be in for some Newman Enterprises corporate intrigue. All three could use a good laugh! 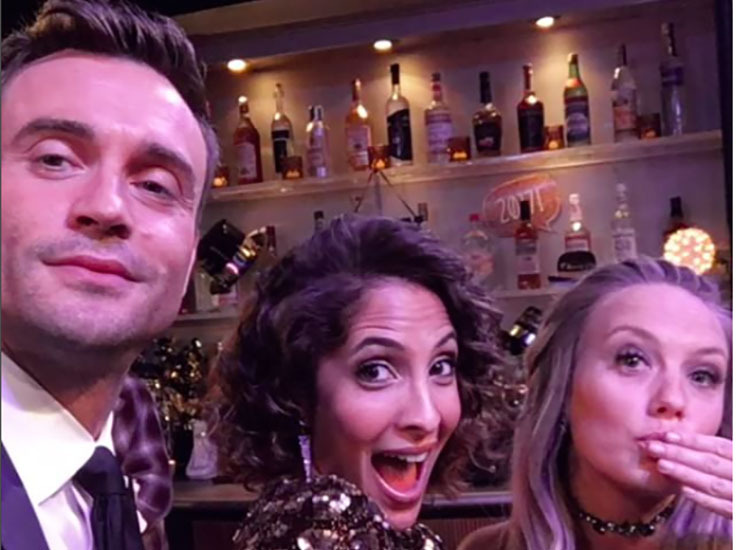 Well, at least we can revel in the wonderful wackiness engaged in by these Y&R stars. Previous ArticleB&B Feb Sweeps: Love Quinn-trangle! You know I realize that this is a soap but come on Nikki get a backbone victor is in charge and be damed if an illness or disease gets in the way!